The Battle of Britain ended and Hitler's planned invasion died. One followed the other, so the first must have caused the second, right? Well, this book challenges that assumption. Determined to bomb the English into submission, the German Luftwaffe attacked London nearly every night, targeting the heart of the city and the site of some of its greatest landmarks. Germany: The Nazis burn a massive number of unacceptable books throughout Germany. Germany: The German Labor Front is created to replace all trade unions. The people are told this new organization will build a classless industrial structure for the benefit of all, but not once did it represent labor nor negotiate wages and it made striking illegal. CBI - China: Day 130 of 142 of the 1st Battle of Hebei. Spain: Day 298 of 985 of the Spanish Civil War. Spain: Day 663 of 985 of the Spanish Civil War. CBI - China: Day 308 of 2,987 of the 2nd Sino-Japanese War. Day 93 of 124 of the Battle of Henan. The Japanese 5th Fleet blockades the port city of Xiamen. Day 1 of 3 of the Battle for Amoy Island in the Taiwan Strait. CBI - China: Day 673 of 2,987 of the 2nd Sino-Japanese War. Day 21 of 35 of the Battle of Suizao. ETO: Day 1 of 8 of the Battle of The Netherlands. "X-Day" begins with German paratroopers securing key bridges and airfields. However, the Dutch are able to hold the Ypenburg airfield, preventing their political leaders from capture. The Battle of The Netherlands and the Battle of France abruptly ended the so-called "Phony War." USA: US Secretary of State Hull says that the US will not stand for any country establishing a protectorate over the Dutch East Indies. In response, the Japanese Foreign Minister indicates Japan's desire to maintain the political and economic status quo in the Pacific region. UK: British Prime Minister Neville Chamberlain has already decided to resign, but the news of Germany's invasion of the Low Countries gives him second thoughts. But it does not matter, as King George VI asks Winston Churchill to take Chamberlain's place. Churchill, who was known for his military leadership ability, was appointed British prime minister in Chamberlain's place. He formed an all-party coalition and quickly won the popular support of Britons. 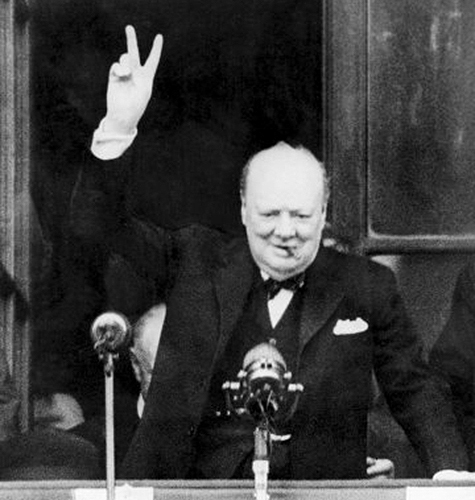 On May 13, in his first speech before the House of Commons, Prime Minister Churchill declared that "I have nothing to offer but blood, toil, tears, and sweat" and offered an outline of his bold plans for British resistance. 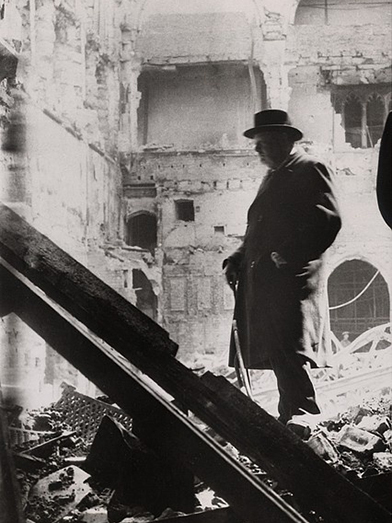 In the first year of his administration, Britain stood alone against Nazi Germany, but Churchill promised his country and the world that the British people would "never surrender." They never did. ETO - Norway: Day 32 of 63 of the Battle of Norway. ETO - Luxembourg: The neutral nation of Luxembourg easily falls to the Germans within a few short hours. ETO - Belgium: Day 1 of 19 of the Battle of Belgium. British and French troops form a defensive line at the Dyle River. ETO - France: Day 1 of 44 of the Battle of France. This battle begins with the Luftwaffe attacking French air bases, destroying many of their planes on the ground. CBI - China: Day 1,039 of 2,987 of the 2nd Sino-Japanese War. Day 178 of 381 of the Battle of South Guangxi. Day 10 of 49 of the Battle of Yichang. ETO - UK: Day 247 of 258 of the Blitz. 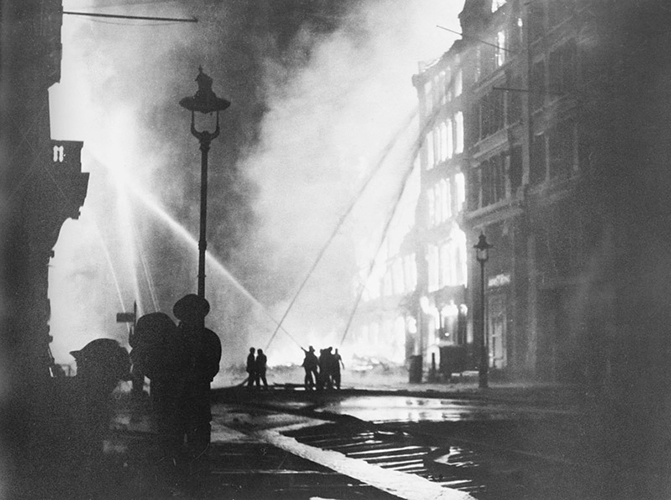 Known as the "Longest Night," this raid is the heaviest attack on London so far, killing 1,436 and leaving 155,000 homes without power and water. East London during the "Longest Night"
The Luftwaffe flew over 500 sorties to London during this, the last major raid during the London Blitz. It was not the last time London would be bombed, but it was the end of the major campaign that had started on 07 Sep 40. The bombing lasted nearly seven hours, starting at 11:00 pm on 10 May and continuing until the all-clear sounded at 5:50 am the next morning. Destruction was spread out all over the city, with German bombers targeting all bridges west of Tower Bridge, factories on the south side of the Thames, the warehouses at Stepney, and the railway line that ran north from Elephant and Castle. An especially low tide on the Thames made drawing water for firefighting difficult and there were more fires than usual. There was damage to many important buildings including the Houses of Parliament, and also to thousands of ordinary homes over a wide area from central London to its suburbs. With Hitler's attention focused on preparations for Operation BARBAROSSA - his ill-fated foray into Russia commencing on 22 Jun 41 - the first phase of the Blitz came to an end. Raids became much less common and many chose to take their chances in their homes rather than wait it out in the bomb shelters, where the sound of every explosion was amplified by the close concrete walls. London had taken everything Hitler could throw at it since the previous September and was still standing. 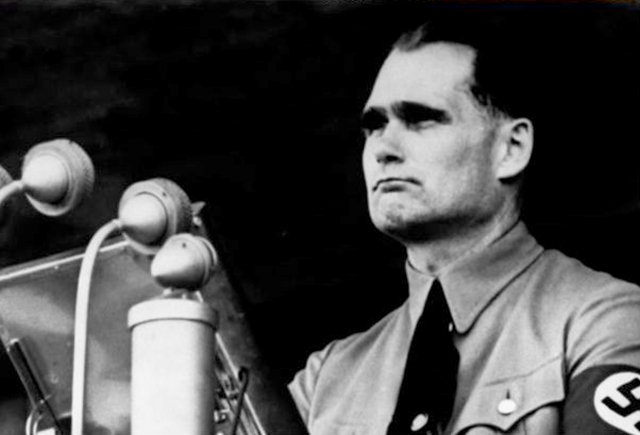 12 Dec 40: First night of the "Sheffield Blitz"
15 Dec 40: Second night of the "Sheffield Blitz"
10 May 41: Blitz raid known as the "Longest Night"
ETO - UK: Deputy Führer Rudolf Hess lands in Scotland in an attempt to broker a peace between the UK and Germany. He is quickly arrested and kept in custody until his death in 1987. Hess was second in succession to the Nazi leadership position under Adolph Hitler. He is commonly perceived as a "lone nut" because of his flight to Scotland to "broker a peace." Hess' flight, but not his destination or fate, was first announced by Munich Radio in Germany on the evening of 12 May 41. The story is soon given out to the German media that mystics, astrologers and nature healers had manipulated a mentally disturbed Hess. After Germany's surrender on 08 May 45, Hess, facing charges as a war criminal, was ordered to appear before the International Military Tribunal and was transported to Nuremberg on 10 Oct 45. Hess was found guilty on two counts: crimes against peace (planning and preparing a war of aggression), and conspiracy with other German leaders to commit crimes. He was found not guilty of war crimes and crimes against humanity and was given a life sentence which he served at Berlin's Spandau Prison under guard by Western Allies. Hess died on 17 Aug 1987 at the age of 93 in a summer house that had been set up in the prison garden as a reading room. He took an extension cord from one of the lamps, strung it over a window latch, and hanged himself. As usual, conspiracy theories have surfaced suggesting that Hess flew to Scotland with Hitler's full knowledge and blessing to meet with a faction of British royalty, but that Churchill, unwilling to compromise, got to Hess first, locked him up and thwarted the Royals' plan. Theories also suggest that Hess had been murdered in 1987 by British Secret Intelligence agents to keep him from revealing information about British misconduct during the war. Some go so far as to say that the real Hess was murdered in 1941 and an impostor flew to Scotland, was tried at Nuremberg and was subsequently incarcerated. Atlantic: German sub U-556 sinks the British ship EMPIRE CARIBOU and Belgian ship GAND between Greenland and Iceland. Atlantic: The German sub U-110, captured by HMS BULLDOG on the previous day, sinks while being towed toward Iceland. However, the Enigma machine and code book had already been retrieved. ETO - Germany: The RAF bombs Hamburg. MTO - Libya: Day 31 of 256 of the Siege of Tobruk. British destroyers bombard Benghazi. After nightfall, the British gunboat HMS LADYBIRD shells Gazala 30 miles west of Tobruk. Middle East: Day 9 of 30 of the Anglo-Iraqi War in Iraq. East Africa: Day 335 of 537 of Italy's East African campaign in the lands south of Egypt. Indian troops march out the Falagi Pass toward the 11,400-foot Mount Gumsa east of Amba Alagi, Abyssinia, causing the Italian troops to withdraw into Amba Alagi after sundown. CBI - China: Day 1,404 of 2,987 of the 2nd Sino-Japanese War. Day 4 of 21 of the Battle of South Shanxi. Atlantic: Day 117 of 169 of Germany's Second "Happy Time," during which U-boats sink 609 Allied ships with little risk. U-506 damages the US tanker AURORA south of New Orleans, Louisiana. ETO - UK: In hearing that Germany might use gas weapons against the Soviet troops, Churchill promises that the UK will retaliate with gas weapons. ETO - UK: The P-51 Mustang fighter sees combat for the first time with RAF pilots in the cockpits. Germany: A new concentration camp is opened near the village of Maly Trostenets near Minsk, Russia. This camp will use mobile gas chambers which are vans that will gas the Jews as they are brought to the camp only to be buried upon arrival. Russian Front - North: Day 245 of 872 of the Siege of Leningrad. Russian Front - North: Day 92 of 102 of the Battle of the Demyansk Pocket, another failed attempt to break the siege at Leningrad. Russian Front - North: Day 6 of 658 of the Siege of the Kholm Pocket. Russian Front - South: Day 193 of 248 of the Siege of Sevastopol, Crimean Peninsula. The battle gets really ugly as the Germans begin pouring it on. Russian Front - South: Day 3 of 12 of the Battle of the Kerch Peninsula, Crimea. The Soviets are forced to retreat. MTO - Malta: German Field Marshal Kesselring prematurely announces that Malta has been neutralized. But as soon as he speaks, the RAF attacks, marking a turning point for Malta. East Africa: Day 6 of 186 of the Battle of Madagascar. CBI - Burma: Day 148 of 164 of Japan's Invasion of Burma. The Thai Phayap Army invades Shan State. In western Burma, Gurkha units, rear guarding the British general retreat, hold off another Japanese assault throughout the afternoon. CBI - China: Day 1,769 of 2,987 of the 2nd Sino-Japanese War. PTO - Malaya: Day 81 of 357 of the Battle of Timor Island. PTO - New Guinea: A Japanese invasion force departs from Rabaul for Ocean (Banaba) and Nauru Islands. PTO - New Guinea: US 5th Air Force B-25s bomb the Japanese seaplane base on Deboyne Island. PTO - Philippines: US General William Sharp orders the surrender of all remaining US and Filipino troops. Russian Front - North: Day 610 of 872 of the Siege of Leningrad. Russian Front - North: Day 371 of 658 of the Siege of the Kholm Pocket. MTO - Tunisia: Day 175 of 178 of the Battle of Tunisia. The British 6th Armoured Division takes Hammamet, thus cutting off the German troops at Cape Bon. RAF and US Air Forces provide air support. MTO - Italy: US 12th Air Force RAF Wellingtons bomb at Palermo. CBI - Burma: US 10th Air Force attacks at Kwitu, leaving several areas burning fiercely. CBI - China: Day 2,134 of 2,987 of the 2nd Sino-Japanese War. CBI - Indochina: US 14th Air Force attacks targets in the Nam Dinh and Hanoi areas, destroying 4 locomotives, 3 riverboats and several trucks carrying troops. PTO - Alaska: Day 338 of 435 of the Battle of Kiska, Aleutian Islands. US troops invade Attu. PTO - New Guinea: Day 19 of 148 of the 2nd Battle of Lae-Salamaua. US 5th and 13th Air Forces provide air support. PTO - Solomon Islands: Japanese warplanes attack US positions in the Russell Islands, but the attack is turned back by US fighters. ETO - France: The French Resistance claims they have over 100,000 fighters and requests more military aid from the Allies. ETO: US 9th Air Force B-26s attack marshalling yards, airfields and V-weapon targets in France and Belgium while P-47s and P-51s dive-bomb targets in northwest Europe for the sixth straight day. Russian Front - North: Day 99 of 191 of the Battle of the Narva Isthmus, Estonia. Both German and Soviet troops remain in their defensive positions. Russian Front - South: Day 33 of 35 of the Battle of the Crimea. 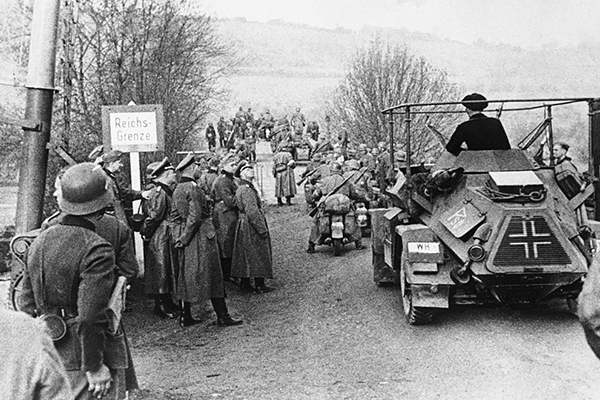 German troops continue to withdraw. Russian Front - South: Day 33 of 60 of the Battle of Romania, 1st Jassy Offensive. MTO - Austria: US 15th Air Force B-17s and B-24s bomb industrial targets at Wiener Neustadt. MTO - Italy: Day 115 of 123 of the Battle of Monte Cassino. RAF and US Air Forces provide air support. The German Gustav Line continues getting weaker. MTO - Italy: Day 110 of 136 of the Battle of Anzio. RAF and US Air Forces provide air support. CBI - Burma: Day 67 of 166 of the UK's Operation THURSDAY. CBI - Burma: Day 62 of 147 of the Battle of Myitkyina. US 10th Air Force provides air support. CBI - Burma: Day 40 of 302 of the Chinese Salween Offensive. In a drive to free the Burma Road, Chinese troops cross the Salween River on a 100 mile front and attack Japanese positions in northern Burma. US 14th Air Force provides air support. CBI - China: Day 2,500 of 2,987 of the 2nd Sino-Japanese War. Day 24 of 259 of Japan's Operation ICHI-GO. Day 24 of 39 of the Battle of Central Henan, the first offensive in Japan's Operation ICHI-GO. Chinese troops are getting pushed out of central China. CBI - India: Day 64 of 118 of the Battle of Imphal-Kohima. Japanese troops attack Scraggy Hill while Japanese Zero fighters strike at Bishenpur. PTO: The USS COD sinks the Japanese destroyer KARUKAYA and a cargo ship. PTO - Marshall Islands: The US 7th Air Force bombs targets in the Jaluit and Wotje Atolls. PTO - New Guinea: Day 72 of 80 of the Battle of the Admiralty Islands. 5th Air Force provides air support. PTO - New Guinea: Day 148 of 597 of the Battle of New Britain. US 13th Air Force provides air support. PTO - New Guinea: Day 19 of 481 of the Battle of Western New Guinea. PTO - Solomon Islands: Day 192 of 295 of the Battle of the Bougainville Islands. US 13th Air Force provides air support. Atlantic: The German sub U-249 puts in at Portland, Maine, becoming the first U-boat to surrender. Atlantic: German sub U-977 surfaces near Holsenöy Island, off Bergen, Norway to release 16 of its crewmen who want to return home to their families. She then heads for Argentina instead of surrendering. Germany: German photographer Heinrich Hoffmann, best known for his many published photographs of Adolf Hitler, is arrested by the Americans. He will be tried and convicted of Nazi profiteering and sentenced to four years in prison. Russian Front - Center: Day 5 of 6 of the Battle of Prague, Czech Republic. Soviet troops gain control of the city and things begin to cool off. CBI - Burma: Day 96 of 99 of the Battle of Pakokku and Irrawaddy River operations in central Burma. The British 14th Army links up with troops from Arakan, trapping all Japanese west of the river. CBI - China: Day 2,865 of 2,987 of the 2nd Sino-Japanese War. Day 40 of 91 of the Battle of Zhijiang. US 14th Air Force provides air support. Day 32 of 60 of the Battle of West Hunan (near Zhijiang). Japanese troops continue withdrawing from southern China. PTO - Alaska: US 11th Air Force bombs shipping at the Kataoka naval base on Shimushu Island and between Kashiwabara and Kataoka. PTO - Caroline Islands: US 7th Air Force bombs airfields on Param and Moen Islands in Truk Atoll. PTO - Dutch East Indies: Day 10 of 52 of the Battle of Tarakan Island. PTO - Formosa: Japanese kamikazes hit and damage two British carriers, the HMS VICTORIOUS and HMS FORMIDABLE. PTO - Japan: US 20th Air Force B-29s hit the airfields at Matsuyama, Usa, Miyazaki, and Kanoya on Kyushu and Shikoku Islands while others hit targets at Tokuyama, Otake and Amami-O-Shima. PTO - Japan: Day 40 of 83 of the Battle of Okinawa. PTO - Korea: US Navy fighters attack Japanese shipping off Korea. PTO - New Guinea: Day 500 of 597 of the Battle of New Britain. US 10th Air Force provides air support. PTO - New Guinea: Day 384 of 481 of the Battle of Western New Guinea. US 10th Air Force provides air support. PTO - Philippines: Day 203 of 299 of the 2nd Battle of the Philippines, aka the Liberation of the Philippines or the Philippines Campaign. PTO - Philippines: Day 147 of 244 of the Battle of Luzon. 5th Air Force provides air support. PTO - Philippines: Day 62 of 159 of the Battle of Mindanao Island. 5th Air Force provides air support. PTO - Philippines: Day 54 of 135 of the Battle of the Visayas region. US 5th and 7th Air Forces provide air support. The horrific bombing raid that almost brought Britain to military collapse. Extensive survivors' testimony and previously classified documents reveal just how close the Luftwaffe came to total victory. An historical novel about woman pilots who fly during WWII, the central character being the son of one of the British woman ferry pilots.